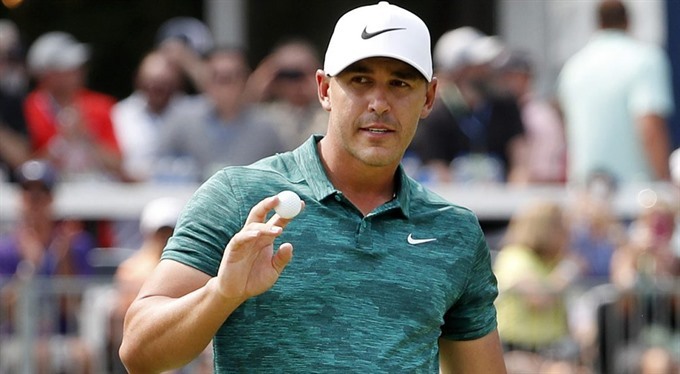 MIAMI — Brooks Koepka, this year’s US Open and PGA Championship winner, was announced on Tuesday as the US PGA Tour Player of the Year, having won a vote by tour players. The 28-year-old American captured the Jack Nicklaus Trophy after a historic 2017-18 campaign that saw him defend his US Open crown by winning at Shinnecock and then deny Tiger Woods a 15th major title by holding off a final-round rally in August at Bellerive. Koepka, who missed nearly four months in early 2018 with a left wrist injury, also managed four other top-10 efforts in the season, including second-place finishes at the WGC HSBC Champions and at Colonial. "Brooks has brought a new brand of athleticism to the PGA Tour and we saw the results this year with his historic season at the major championships," said tour commissioner Jay Monahan. "These feats were accomplished despite missing significant time due to injury, a testament to his work ethic and perseverance throughout the season." Other finalists for the award included Englishman Justin Rose, British Open champion Francesco Molinari of Italy and Americans Dustin Johnson, Bryson DeChambeau and Justin Thomas. Koepka became the first player since Curtis Strange in 1988-89 to win back-to-back US Open titles, then took his third major crown at the 100th PGA Championship with a tournament-record 16-under 264 for 72 holes. Koepka became only the fifth player to win the US Open and PGA in the same season and the fifth American since 1945 to win three majors before turning 29.